All butter shortbread with chocolate chips. 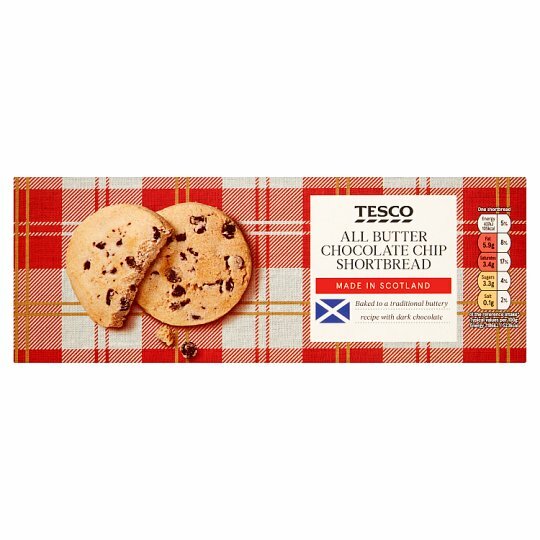 MADE IN SCOTLAND Baked to a traditional buttery recipe with dark chocolate. INGREDIENTS: Wheat Flour [Wheat Flour, Calcium Carbonate, Iron, Niacin, Thiamin], Butter (Milk) (31%), Dark Chocolate Chips (14%) [Cocoa Mass, Sugar, Cocoa Butter, Fat Reduced Cocoa Powder, Emulsifier (Soya Lecithins)], Sugar, Salt.